We are amused by the very different migration tactics of Nad (LLJ) and Charlie (LLK). 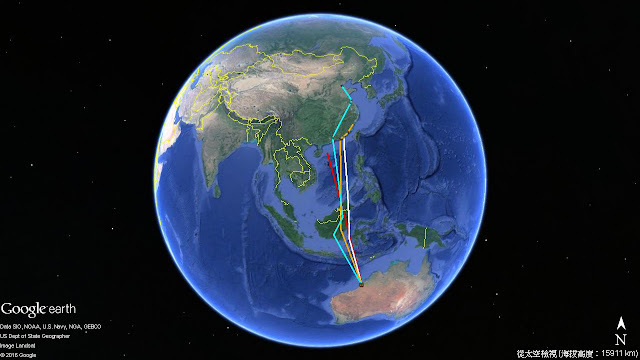 These two birds departed Broome on about the same date but are now more than 1,300km apart on the China coast. 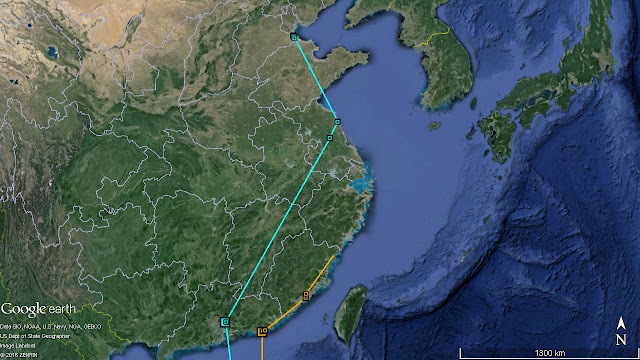 After spending 3 days at the inland area, Nad is now back to the coast in southern Bohai Bay in Hebei Province. Besides using the mudflat area, it is also utilising some aquaculture ponds at the coast presumably as high-tide roosting area. While Nad has already travelled another 1,800km in China, Charlie (LLK) has only made one third of the distance in the same period of time. It is progressing slowly along the coast of Guangdong and Fujian Province. Unfortunately our worst fears have been realised, with yet another transmitter ceasing to send signals. Mymi (LLH) last sent a signal on 23th April at the South China Sea, just 250km away from the China coast. At that point she had flown for 5 days since she had left Broome on 18th April and had covered 4,200km at approximately average speed of 36kms per hour. It could be that she was adversely affected by the strong depression which was at the south China coast at the time she disappeared. But the cause of failure could well have been the same mysterious problem which affected most of our satellite transmitters on Little Curlew last year and also Ecosure (LLA) last week. One theory is that at the end of a long non stop flight birds become so thin that the harness holding the satellite transmitter on the birds back become too loose, allowing the transmitter to fall off. We will continue to hope that there is some other cause (eg. shortage of solar power) and that these two transmitters start send signals again in the near future. Now we have only 2 eggs left in the basket. Let us hope that Nad and Charlie (and their transmitters) do survive and tell us most of all what we want to know; where our Grey Plover actually breed and what route they actually use to get there from the Yellow Sea. You'll need to check with the Australian Wader Study Group for those details Igor.